I just finished watching a BBC documentary exposing the real cause why Primark's goods are cheap. Primark is like Landmark here in the UK. The only shop I know where you can get a decent, trendy blouse for £3, a dress for £5 and a jacket for £10. And those prices are regular prices, not on sale. Indeed in a country where Marks and Spencer is considered affordable and ordinary with the same status as our SM, Primark is a beacon of hope for me. And the droves shoppers that go to its store everyday is proof that I'm not alone in this delight. I had wondered, that for in a country where retail tax is one of the highest in the world, how Primark can afford to yank their price tags so low. Well I got my answers from that BBC documentary. BBC found out that workers employed by 3 of Primark's suppliers in India were being forced to work 66 hours a week with salary half the required minimum wage. And to meet Primark's demands to manufacture goods at very low cost, these suppliers outsourced works to women and children working in residential areas who were paid even less. BBC showed a heartbreaking video of children sewing each sequin of a beaded vest and they're just paid 50 pence for each finished vest. Primark of course denied that they knew about these practices of their 3 suppliers featured in the BBC's exposé. 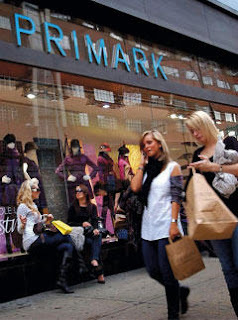 Primark cut off their ties from those suppliers saying that they don't tolerate any supplier violating their high ethical standards. But what Primark did was just running away, leaving those hundreds of workers unemployed. Now that is very unethical. I do love cheap clothes for they allow me to experiment on fashion without burning a hole in my pocket. But after watching that, I am not sure if I'll be comfortable anymore wearing those clothes stashed in my drawer. I guess I'll have the uneasy feeling that maybe a child or a worker had been paid less than his/her effort in sewing my blouse. But there's also the dilemma that if I start boycotting the likes of Primark, along with others who are surely thinking of the same tonight, hundreds will lose the jobs that somehow bring a little bit of needed food on their tables. Hmmm, what to do?